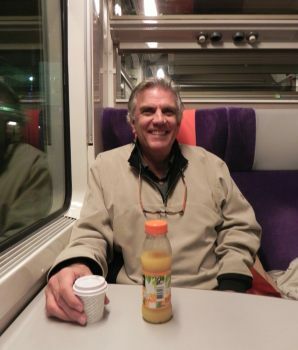 I spent a week in Paris with Larry and Cyndee Perkins (my brother and his wife) who rented an apartment in Montmartre for two months. I had never been to Paris, but I knew what I wanted to do – enjoy the art masterpieces, eat good food, and drink great wine. In preparation, I read my guide books and learned some basic French phrases; prepped by one of Cyndee’s previous blogs, I could both count to ten AND attend to my personal needs. But I wasn’t prepared for everything. The Parisian people are very pleasant and courteous. I had heard stories about how they did not like Americans. Well, a smile and a friendly “bonjour” from me got an immediate return smile and greeting. One gentleman helped translate so that I could get an espresso and some orange juice at the train station. He smiled and said, “It’s hard (learning French), but keep at it.” Thanks to his encouragement, I kept trying! I had the best baguette in the world, every day. A local boulangerie (bakery) in Montmarte was recognized in 2011 as providing the “Best Baguette in Paris”. If their baguette is the best in Paris, I think it is probably the best in France, and the best in France must be the best in the world. Sometimes I bought two … one to take home for dinner, and one to eat on the way! Most women in Paris have legs that go to their shoulders. Even short women seem to have long, shapely legs. This year’s fashion trend of short skirts and high-heeled boots provided a visual delight … to go along with so many other Parisian attractions. The Eiffel Tower is massive. Even though I could see it from almost any place in the city, I had no conception of how large it really is. The Statue of Liberty is 305 feet (about 30 stories high); the Arch in Saint Louis is 630 feet. The Eiffel Tower is about 40% higher at 1,063 feet. 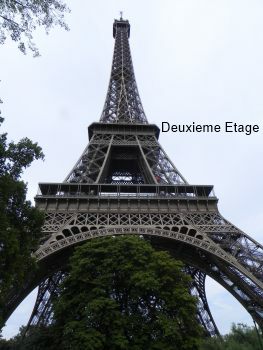 Once I got to the Deuxieme Etage of the tower, I was happy to stay right there … no need for a “bird’s eye view” from the top of a tower swaying in the wind! The Paris Metro (subway) is awesome. The apartment was only a couple of blocks walk to the Metro. 32 Euro ($40) for a 5 day pass to go anywhere in Paris is such a deal! The system is easy to follow and I could have done it on my own by the end of the second day (though glad I didn’t have to, having the two best tour guides in Paris…see #1) . The necessary walking and standing in line to see Paris attractions was definitely a surprise! Sometimes we stood in line to stand in another line (Stand in line to buy a ticket to go up the Eiffel Tower; stand in another line to get on the elevator after you have your ticket.) I learned that Paris has more tourists than any other city in the world. I believe most of them had descended upon Paris when I was there. On the other hand, I walked more than 50 miles in six days. That was good, because I could eat a second baguette every day! 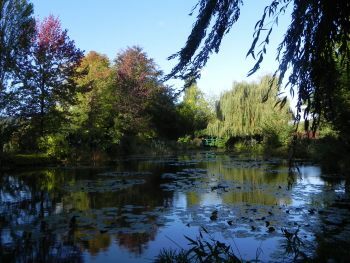 Giverny is a magical place. Okay, Monet’s home is a 45 minute train ride from Paris, but give me a little author’s license here. I saw the pond with the “Water Lilies” and the Japanese bridge; I sat, stared, trying to see and feel what Monet saw well over 100 years ago. Well, maybe not exactly what HE saw, but I sure felt a lot of emotion. Watching and hearing my nephew’s 6 year old daughter sing her heart out on the balcony of the apartment for no apparent reason made me realize that just being in Paris makes you feel good. Watching her lean out the second story window of a restaurant where we were having dinner, and hearing her call “Bonjour, Bonjour” to the passers-by showed the true joy only a child, or the child in us, can express. The special time I had with Larry and Cyndee, the two best tour guides in Paris. We have always been close but this is a very special memory for me and there is no way I will ever be able to thank them for their hospitality, their joy of living and most important, their love. Oh I how wish I were able to visit with you Jeff. Loved your #8 and can see you now walking the streets and enjoying the sights. David Letterman watch out. Great posting! 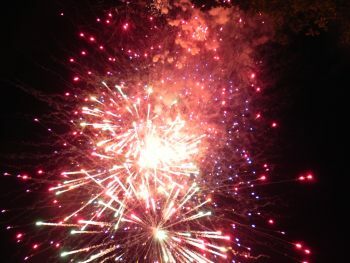 Wonderful to live vicariously through you…..Jeff. Thanks for sharing! I long for a baguette….NOW! So glad you had a wonderful time, Jeff. We knew you would. Sure there had to be more than 10 things -probably like 10 per day. Karen P.